A call for ensuring a human face in the the era of artificial intelligence marked the inaugural series of the “World Forum for Ethics in Innovation” on Monday at the German Patent Office in Munich. A joint initiative of Max Planck Institute, one of the foremost research institutes in the world and The World Forum for Ethics in Business, the conference brought together multiple stakeholders to seek answers to ethical questions in innovation. 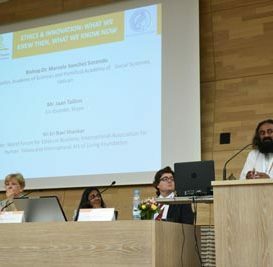 Gurudev Sri Sri Ravi Shankar, Founder of the World Forum for Ethics in Business along with Jaan Tallinn, co-founder of Skype, inaugurated the conference. 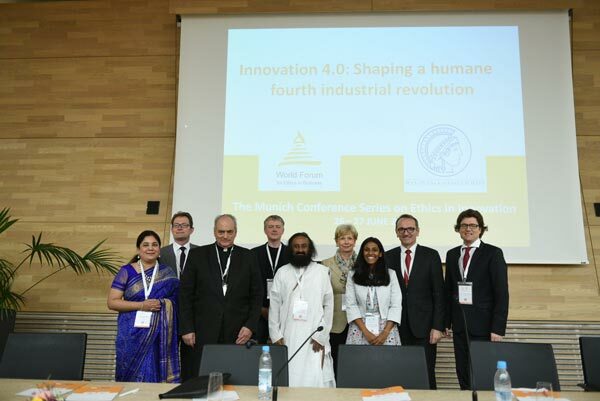 Citing examples of misuse of innovation for commercial purposes even at the cost of putting millions of lives at risk, Gurudev emphasised the importance of ethics in innovation. “Deliberately withholding information for commercial interests is very unethical. When we’ve made a discovery that is useful for mankind, then it should be made available to everybody,” he said, adding that the ultimate purpose of any innovation is to bring happiness at the individual level. Jaan Tallinn cautioned the gathering of the risks that artificial intelligence brings with it and emphasised that there should be more funding for AI-risk related research. Bishop Dr. Marcelo Sorondo, Chancellor of the Pontifical Academy of Social Sciences in the Vatican, implored the gathering to build a connection with nature, adding that in order to be creative, we merely need to develop the potential that’s already present in nature. Global thinkers and leading experts from academics, business, politics and NGOs deliberated on critical concerns about the new era of fourth industrial revolution the humanity is set to enter. It saw leading scientists turning towards Indian spirituality for setting ethical standards in innovation. The conference witnessed deliberations by an impressive list of speakers including Prof. Dr. Ferdi Schuth, the Vice President of Max Planck Society; Mr. Jo Leinen, Member of European Parliament; Mrs. Yvonne Feri, National Councillor for Switzerland; Dr. Ashok Jhunjhunwala, Advisor to the Indian Government and several professors from world renowned universities. At a time when the world is on the verge moving into the era of Artificial Intelligence, the conference explored answers to important questions, such as, “Should growth be the main guiding principle for the 4th industrial revolution?”, “How do we make it more humane?”, “What type of leadership do we need to create to deal with this novel situation?” and “What type of education do we need in order to cater to the needs of the changing society?”.